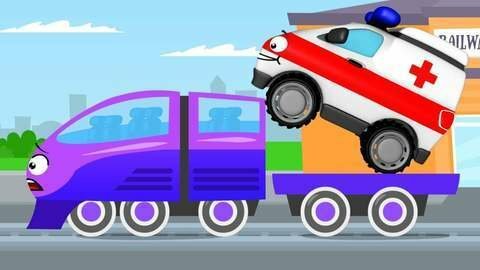 Check out this cartoon video starring Ambulance and his trusty friends! You can catch up on all your favorite Ambulance cartoons right here! Kids can watch Ambulance and his friends Police Car and Fire Truck as they do their work for the city. These videos for children teach them about the duties of police, firemen, and ambulance workers. They learn the importance of these workers in society, and also how to get help from them if kids ever need it. Kids also get to see cartoon forms of their favorite cars and trucks, and learn about their unique features, while being entertained. These videos are from the makers of “Greatest Cartoon Garbage Truck Video.” Both of these educational cartoon shows can only be found online on Seezis!